How much sugar in Belgian Cocoa Dusted Truffles Bianca? How many small sugar cubes (4g) corresponds to 175 g of Belgian Cocoa Dusted Truffles Bianca ? 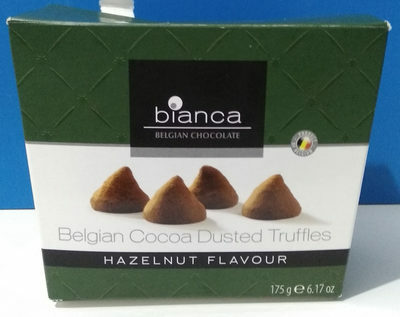 175 g of Belgian Cocoa Dusted Truffles Bianca contains 81 g of sugar, which is equivalent to 20.3 small sugar cubes (4g) or 13.5 bigger sugar cubes (6g). See if your friends know the answer! To see the cubes fall, you need a newer browser, please upgrade it. Use the + buttons to indicate how many small sugar cubes (4g) corresponds to 175 g of Belgian Cocoa Dusted Truffles Bianca. Then press the ✓ button to check your answer. Mice love sugar! Use your mouse to grab pieces of sugar and pile them up or throw them in the air as it pleases you. The food products data and pictures come from the collaborative, free and open Open Food Facts database. The data is available under the licence Open Database License and the photos are licensed under the licence Creative Commons Attribution Share-Alike. The brands quoted are the property of their respective owners. The database is built in a collaborative way through crowdsourcing (like Wikipedia), it is not possible to guarantee that it does not contain any error. The composition and nutrition facts of food products may also have changed. If you see an error, please let us know so that it can be corrected. You can also correct it yourself on Open Food Facts. → more info on "How much sugar?"